Manaus is the capital of Amazonas State in Brazil and is the chief port for the region's river system. It's close proximity to the Amazon Rainforest allows ample access to boat and land trips into the jungle. 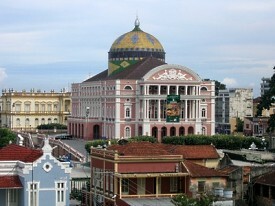 Popular sites include the Teatro Amazonas opera house, Ponta Negra Beach, the CIGS Zoo, and the Mercado Adolpho Lisboa marketplace. Most Amazon River cruises begin or end in Manaus. The Port of Manaus is located approximately a half hour from Eduardo Gomes International Airport. From the airport, turn right onto Av. Santos Dumont and drive for 2.5km. Turn slightly right onto BR-174, and continue straight to stay on BR-174 for 6km. Turn right onto Av. Leonardo Malcher, then turn left onto Rua Luiz Atony. Turn right onto R. Gov. Vitorio, then turn right onto R. Visc. de Maua. Finally, turn left onto R. Taqueirinha and your destination will be on the left.